And lo, Ogrim Doomhammercast his baleful glare across the blackened landscape, and he turned, fist raised to the blood-red sky, and called out to his legions: "Tonight, we dine on the entrails of our enemies! But first, lemme take a selfie." I actually think the video, with cutesy animated characters engaging in ridiculous violence—and snapping photos of it all— is pretty amusing. But even if it's not your particular cup of comedy, the contest itself sounds like it could be fun. The rules are simple: Find the location indicating in the sample photo, take a picture of yourself in the same situation (including, presumably, being a half-second away from getting clocked in the skull with an axe), and then submit it. 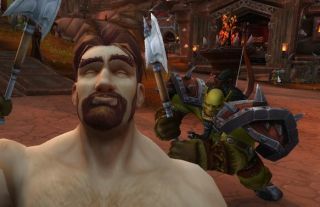 More challenges, presumably in the form of taking pictures of yourself in ever-more ridiculous situations, will be issued weekly, with prizes of Blizzard gear, Battle.net balance codes, and an iPhone up for grabs. The grand prize will be a trip for two to BlizzCon 2015, including round-trip airfare, three nights accommodation, and a pair of BlizzCon badges. The WoW Selfie Scavenger Hunt is underway now and runs until June 22. Details, including a submission link and instructions on how to take a WoW selfie, are up at blizz.ly/WoWSelfie. BlizzCon 2015 runs from November 6-7 at the Anaheim Convention Center in Los Angeles.